This is one of my favourite mud cakes as it combines a chocolate mud cake with a white chocolate mud cake, all in the one cake. It looks nice when sliced, with its alternate layers. Simple to make, lovely to eat. 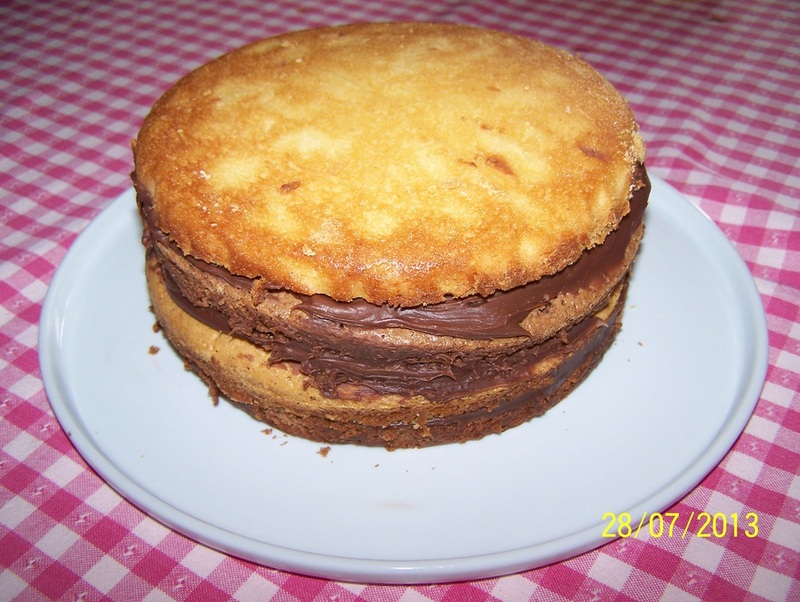 I've recently made it into a double decker checkerboard cake, you will find the recipe in my party cakes page. 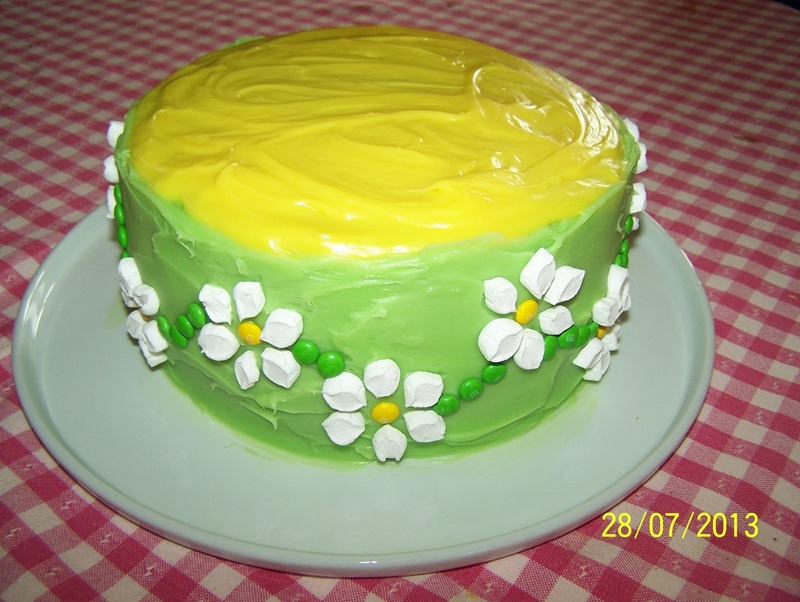 As this cake is not very high and if you need a high cake like in the daisy chain cake below, just bake two of these double decker mud cakes, don't slice them, just sandwich the layers together. For a change you can ice the cake with a white chocolate ganache. Preheat oven to slow 160C. Grease and line with baking paper base and sides of two 20cm round cake tins. In a medium saucepan add the butter, chocolate, sugar and milk. Place over low heat, stir regularly until the butter and chocolate have melted and you have a smooth mixture, do not allow mixture to boil. Transfer to a glass mixing bowl, allow to cool slightly for 15 minutes. Whisk the combined flours into the chocolate mixture. Whisk in the eggs and vanilla extract. Now it helps if you have another glass bowl the same size as the one the chocolate mixture is in, as you need to divide the chocolate mixture in half (using a glass bowl of the same size makes it easier). Pour one of the chocolate mixtures into one of the prepared tins. If you don't have two identical bowls, just pour half of the mixture into one of the prepared tins as close as you can. In the remaining chocolate mixture sift in the cocoa, then whisk to combine. Pour into the other prepared tin. Bake cakes for 1 hour and 10 minutes. Remove from oven, leave in the tins for 5 minutes, before placing onto a wire rack to cool, top side up. Chocolate Ganache: In a small heatproof bowl place the chocolate and cream. Place over a saucepan of simmering water, don't let the water touch the bowl the chocolate is in. Mix until all the chocolate has melted and you have a smooth consistency. Place in the refrigerator, every 10 minutes give it a stir until it becomes a thick spreadable consistency. Slice each cooled cake in half. 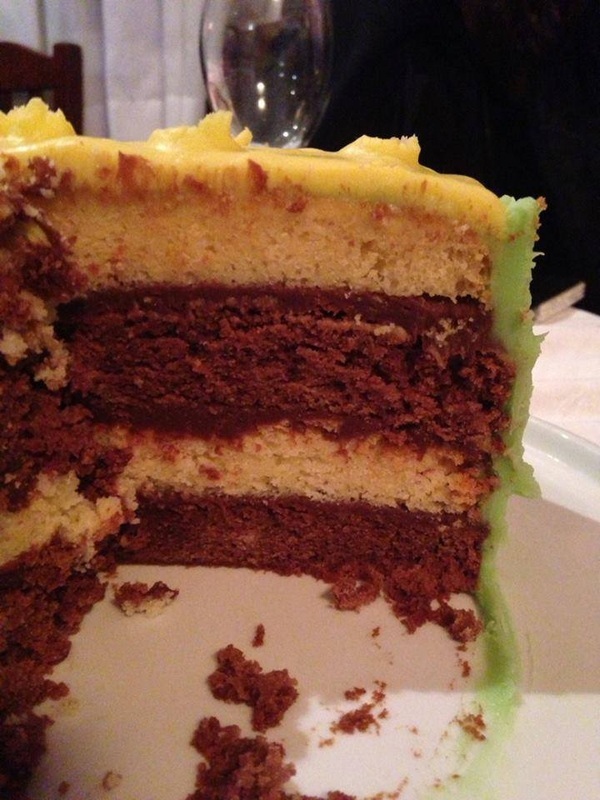 Place one slice of cake on a serving plate, it doesn't matter which colour you start with. Spread a thin layer of chocolate ganache all over cake, top with alternate coloured cake, spread with ganache, repeat alternating cakes by colour. Spread the remaining ganache all over the top and sides of the cake. Decorate if you like or serve as is. You can use white chocolate ganache for a change. 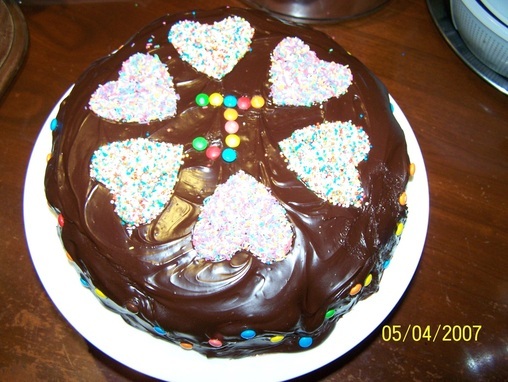 Find the recipe in the Party Cakes page.